Munin has vibrant plugin community. You can easily write your own plugins, even using shell script. Plugins are autodiscovered, so dropping a script file on the server is enough to create your own monitoring graph. Munin master data collection is driven by cron and by default outputs static HTML files. It is very easy to setup and secure, being immune to web attacks e.g. what most legacy PHP systems suffer. Munin has its downsides, too. Like with most open source projects, Munin documentation is rough and not very helpful. The configuration file has its own format and discovering potential variables, values and opportunities is cumbersome. Munin scaling might not be ideal for large operations, both computer-wise and management-wise, but it’s ok up to 10-20 servers. Also Munin alert mechanism is quite naive, and you cannot have alert trigger math functions like e.g. with Zabbix. This brings to the problem: because Munin lacks any kind of math it can perform on monitoring data, it alerts immediately when some value is out of bounds. This may result to unnecessary alerts on temporary conditions which really don’t need system administrator action. Server CPU resource sufficiency is best monitored with load average. 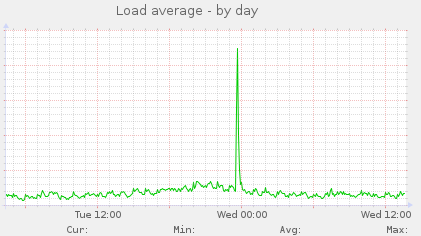 When the load average gets too high, your server tasks are delayed and your response times start to suffer. However there might be various causes for temporary load average spikes, which resolve itself and should not be subject for alerting your devops team. Most of these issues are resolved automatically, within seconds or minutes when they begin. However, because Munin naively monitors only the latest load value, it cannot have logic to determine whether the load alert is genuine or temporary. In Zabbix this problem can be avoided by monitoring the minimum load value over a time period. Because Munin does not support trigger functions, one must calculate the load average smoothing on the server-side. Below is a sample Python script which will monitoring the minimum load average over four Munin report cycles (20 minutes). Thus, it will alert you only if the load has stayed too high over 20 minutes. There exists a Python framework to build Munin plugins. But because the use case is so simple, the script can be self-contained. # Munin plugin for getting the minimum sytem load avg. of 20 minutes. # resolves itself in few minutes. # but do not affect min load (the base load level). # then calculating out the minimum. __author__ = "Mikko Ohtamaa <mikko@opensourcehacker.com>"